WD is combining two high-speed technologies to produce one the fastest and most robust dual-storage system ever offered. 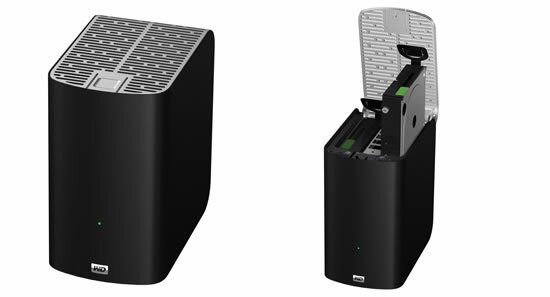 Supported by the Mac OS X operating system, the new My Book VelociRaptor Duo dual-drive storage system becomes the ultimate storage drive for performance hungry Mac computer users and creative professionals. My Book VelociRaptor Duo provides ultimate speed and performance with two 1 TB 10,000 RPM WD VelociRaptor drives along with two Thunderbolt ports. The 2 TB dual-drive storage system is ideal for editing high resolution video, 3D rendering, graphic design, and other demanding digital media applications. This boost in performance delivers solid state drive (SSD) -like data transfer rates of up to 400 MB/s for greater work-flow productivity. My Book VelociRaptor Duo customers will now have the ability to transfer 22 GB full-length HD movies in less than 65 seconds, 2000 5 MB pictures in less than 33 seconds and over 500 5 MB songs in less than 8 seconds. Additional features found on the My Book VelociRaptor Duo dual-drive storage system include out-of-the-box compatibility with Apple Time Machine and HFS + Journaled for Mac computers; capability for multi-stream workflows; and a 3-year limited warranty. The My Book VelociRaptor Duo dual-drive storage system starts for approximately $899.99.